As much of the Pacific Northwest is being hit with ice, snow, and temps down into the teens in many areas, many people wonder if biohazards like bacteria and germs are still a threat. After all, doesn’t the below-freezing temperature kill those germs? The simple answer is, “No.” While it’s true that certain microbes are inactivated by cold temperatures, many have adapted to survive and even thrive in temperatures below 32º. Many health-threatening microorganisms are capable of existing in severe conditions, so long as they have moisture (which is in abundance right now) and a food source. Others simply go dormant (think hibernation) until the conditions improve. The warmer weather will ‘wake them up’ and they’ll get back to their nasty activity. The food service industry has learned this the hard way. Freezing food doesn’t kill any bacteria that might cause deterioration or food-borne illnesses; it simply delays them until they are reheated. 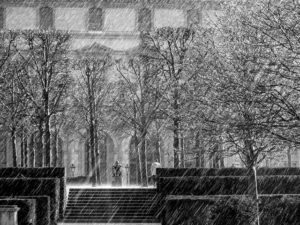 Even mold can’t be killed by freezing; it just gets temporarily deactivated. And with the moist climate we have, mold is definitely an issue. Do not assume that cold temperatures equal dead germs. This winter is somewhat unusual for our area, since we’ve fallen well below the average January and February low of 37º. Tonight’s forecast is for 19º, with overnight temps below 30º for the rest of the week, so it looks like this cold spell is going to continue for at least a few days. Even as far south as Portland they are experiencing weather like this. So while we might expect some reduction of ACTIVE viruses and bacteria that aren’t cold-hardy, many others we deal with will still be around. And that doesn’t even count the ones indoors that aren’t getting exposed to the below-freezing conditions. In those cases, this cold weather can actually cause them to proliferate, because many people who would otherwise be outside (and that includes the homeless) are seeking refuge in warmer spots. Others have curtailed their outdoor activities in favor of indoor pursuits. And at this time of year that makes the conditions right for transmission of contagious diseases like the flu. Just consider what the Seattle area is going through right now with the measles crisis. 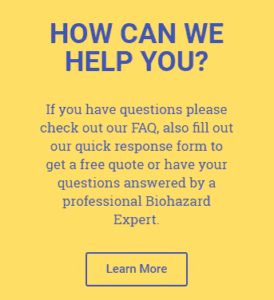 So be safe this winter; take the precautions you normally would to avoid being contaminated by biohazards, and if you’ve got concerns, contact your local biohazard remediation company. Here in the Pacific Northwest, that’s us.